Book writing using mindmapping makes chapters easy to read, compelling, and consistent for readers. If you want to learn how to write a book outline, mindmapping is better than linear outlining because authors can use flexible thinking and relativity in writing their book. 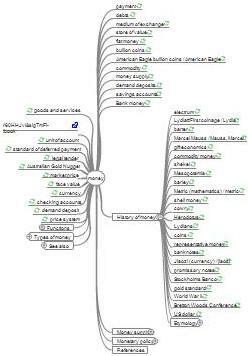 One can add and subtract a thought or phrase from a mindmap easily. This is an excellent way to start, organize, and finish your book. Mindmapping is a color-coded outline of main ideas, sub topics and details, printed on different colored branches connected to the center. In the center in a circle, you will list your main idea, such as your book or chapter title. I created this mindmap for the word "money"
For "The One-Minute Sales Person", Spencer's mindmap would have had seven different colored vertical branches coming from that center, so details can be put on connected horizontal branches - much easier to read. First, this is open-ended and open-minded. No more squeezing new "ahas" or ideas into the strict, tight form of the linear outline. You can make mistakes in your mindmaps. Imperfection leads to creativity. When you get an idea for chapter one, you can just add another branch off the main one. Mindmapping expands flexible thinking, making for better writing. Second, mindmaps use only three to five concrete or color words on a branch. These key words help jog our memory. Under Chapter One "Attracting Passion," I added several horizontal lines that represented the format that follows. One line had "opening quote," the next one "introduction," the next one "Jerry's Story," the next "Food for Thought and Action," the next, "Passion Hot Line," the last line, "practice."